Japanese Themed Garden by Nass Landscapes at Al Areen. The landscaping unit of Nass Contracting is responsible for the greening of some of the prestigious projects under way in Bahrain, including Dragon City and Durrat Al Bahrain. Backed by decades of experience in successfully completing prestigious landscape projects in Bahrain, Nass Landscapes continues to add to the aesthetics of the country’s outdoors with a number of ongoing projects. A division of Nass Contracting, the company was established in 1996 to offer the highest standard of professional services in the field of landscape construction, maintenance, horticulture and irrigation. “With almost two decades of experience, Nass Landscapes has proven its ability to deliver a very wide scope of work from the biggest and most high-value and quality jobs in Bahrain to private villas and public road landscaping, making it the preferred partner of choice,” says Mohammed Mujahid, senior engineer irrigation at Nass Landscapes. Nass Landscapes is also undertaking the installation of irrigation infrastructure at Durrat Al Bahrain, Phase Two for Durrat Al Bahrain’s Petal Four and Five islands. The scope of works includes supply of a high-density polyethylene (HDPE) mainline, isolation valves, solenoid valves and controllers in a contract worth $810,810. Work started in June and is scheduled for completion in February next year. Irrigation infrastructure will also be set up by Nass Landscapes at Diyar Al Muharraq, Phase One for client Diyar Homes, where the company is supplying polyvinyl chloride (PVC) mainline, isolation valves, solenoid valves and controllers under a $297,300 contract. Work will start in September and be completed by December this year. Nass Contracting is the main contractor on all the three projects. 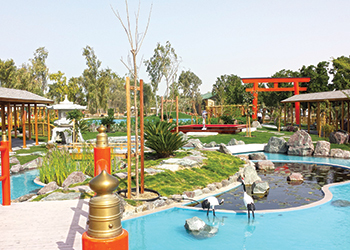 Some of Nass Landscapes’ successfully completed projects include the construction of the Japanese Themed Garden at Al Areen for Gulf Petrochemical Industries Company (GPIC), where various Japanese concept materials, landscaping and irrigation were supplied under a $1.62-million contract. Another striking project is a terrace garden constructed at Fakhroo Tower which included landscaping, irrigation, a water feature and hardscaping. 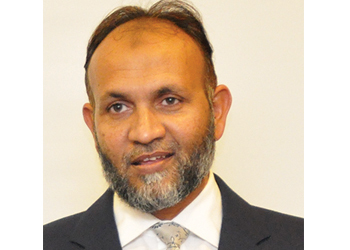 Separately, Mujahid stresses upon homeowners to conserve water by adopting a smart irrigation system especially in the hot summer months when plants need plenty of water. “Most homeowners overwater their yards, unintentionally wasting money every time they take out the hose or turn on the sprinklers. To raise awareness of the benefits of efficient watering practices, the Irrigation Association of the US has named July-August as Smart Irrigation Months,” he says. He says adopting a smart irrigation system is one of the best ways to keep lawns and landscaping beautiful and healthy, while minimising water wastage. He gives 10 valuable tips to help keep utility bills low and protect the environment. 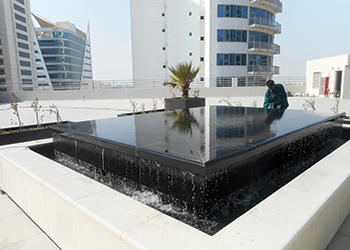 The water feature at Fakhroo Tower. • Water with a target but distribute evenly: Continuous watering at only one root point leads to one-sided root growth and thereby to poorer nutrient absorption in the soil. Therefore, always water around the plant and distribute in the entire irrigation area. • Use quality, clay-rich soil: Soil rich in clay minerals has better expansion properties and can therefore hold water in the soil better and in a more even way. When wet in summers and in winter, ensure water drainage of the soil to prevent waterlogging.